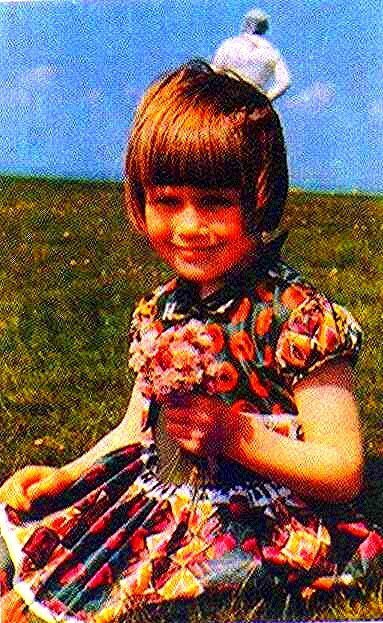 The God the Feathered Serpent, Vishnu as Narasimha, Quetzacoatl, Kulkulcan, Viracocha, Zeus, Enki, Satan #1 the Serpent and every other known Serpent, Dragon or Gargoyle race in history is the Cumberland-Solwayfirth spaceman and Myths are real. Here is the evidence that planet Earth has been inhabited by Extra-/Terrestrials or GODs and they were here before humans and this is the main reason why the human race has evolved and whom in history was partially responsible and the possible evidence that people were confused when being visited by a GOD so who are the "Real Aliens"(humans). The Serpent race, Feathered Serpent, Plumed Serpent, or Quetzalcoatl-Quetzacoatl in Mesoamerica or Viracocha whom was seen many times with a shield or gold disk behind his head, Nagas in India's Shivite history or Vishnu in Hinduism as Narasinha and related, Zeus in Greek mythology(the real serpent Zeus they showed his form when he fathered Alexandria and not the impersonators-Salmoneus for example, Zeus slept around like the Serpent in the Bible, (Greeks also did not like half human-animal statues of the GODS similar to Christian and Catholicism), Enki in Mesopotamian whom saved humanity, Satan #1 the Serpent/Satanail/Lucifer#1/ The Light Bearer/etc... in the OT-NT and was even worshipped by the Ophites of the Old Testament and also wears a horned cap but slightly different. He is just one of many highly intelligent super beings that helped educate humans such as Hermes whom in some myths is also a GOD like Jesus but someone took his name like many have done and wrote in his honor which back then was more of a divine privelidge and other previous life on Earth, humans turned these GODs/Deities/etc.. into evil demonic negative entities verses good demonic which was another term for Divine Beings. 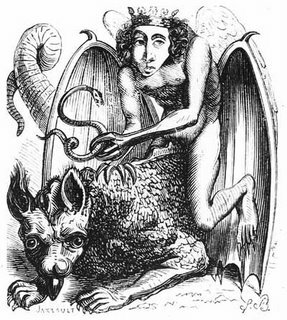 He was in every culture with all there helpers which were called angels/demons/etc...... The list is so huge this blog would be a massive book alone for this one GOD. I am trying to consolidate the history that appears accurate from all the cultures, many sites/books have a ton of dribble and it is the dribble that takes so long to sort out, fact from fiction. 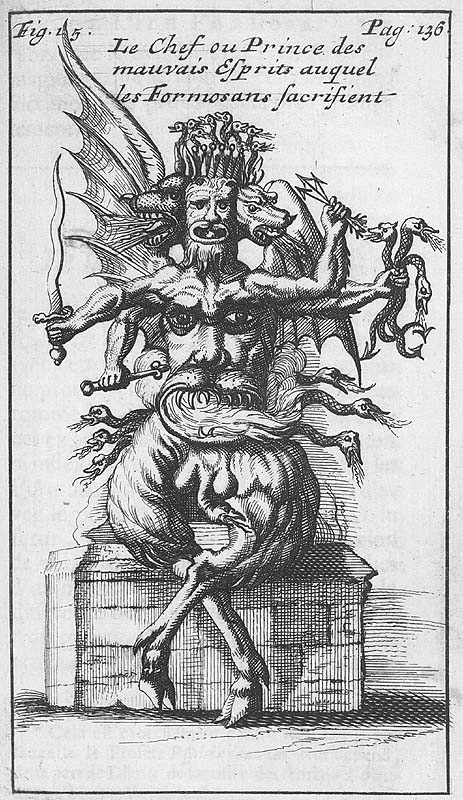 1/07 The new images of Samael 1(There's two), Belphegor, Molech as a bull or owl resembles the Solwayfirth sapceman. The Goat of Mendes: Baphomet, Astaroth, The Jaguar God and Molech as an Owl are wobblers as we can see from others that saw a similar entity but couldn't quite describe what they saw most likely from confusion and these depictions represent both featured GODs. The entity being summoned by Dr. Faust appears similar to Vishnus fourth avatar Narasimha with matching neck attire, Baphomet is also pictured in the upper left corner of the image, this "Elemental entity" could be an assistant or manisfestation to the Baphomet or helper, there is a relationship to Baphomet that quite hasn't been panned out but it most likely is just another respresentation of Satan/Devil that was seen as a "Goat" with a shorter snout that is depicted in other paintings/etc... and the fur was a hand me down belief used as an ignorant reference to degrade the entity, coincidently the Solwayfirth Spaceman does in fact look like a goat too. 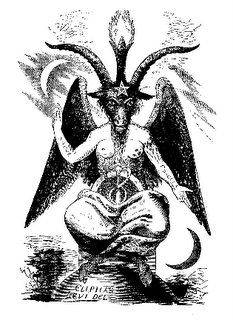 If you look at the other Goat dipiction for the Black God you can see two distict characters one having Goat features in what could even be a white outfit. 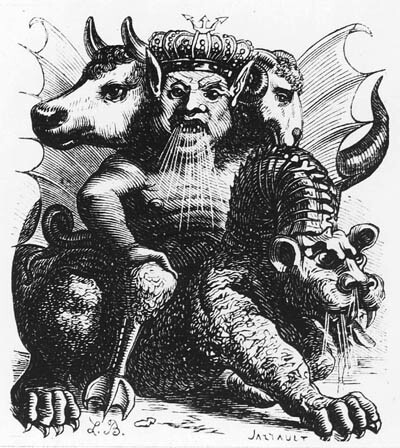 The Black GOD has similar entities that look like him minus the extra large cranium and the smaller entities dipicted by Dr. Faust could be a helper or Dr. Faust experienced at one point seeing the entities go from large to small as a purposely induced hallucinatory event, this is the part that has me stumped for now and the part about PAN being killed?????? which is also another goat GOD figure. Scroll down the images to compare the features from each photo. The other problem with Biblical history is that there were too many writer's whom either were or were not in communication with the sky GODS. The Bible has many contradictions with prophet arguing with prophet. 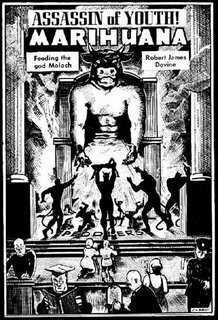 In the first part of the Bible the Ophites worshipped the Serpent, Lucifer or Satanail was a GOD and Angel of GOOD for those that do not read the entire Bible from OT, NT, Nag Hammadi, etc... Somewhere along the way well after Abraham of MESOPOTAMIA when Adam and Eve showed up the once GOOD GOD became the Devil, Beast, Satan the bad GOD or bad angel or Demon. Do we hear Bible scholars preaching this information, the answer is NO but we hear the latter negative conotations completely used out of context, why should anyone read what they preach since that is the tradition of the IGNORANT. The Bible is the story of Abraham whom grew up in Mesopotamia which is modern day Iraq and surrounding areas of the history of Mesopotamia and the life of Abraham and others. 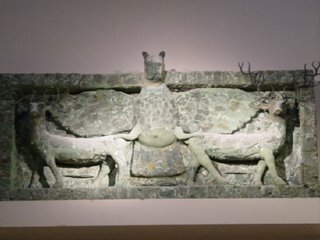 It is a Mesopotamian story with Mesopotamian GODS re-written many times but theologians refuse to accept other history especially if they were brought up Christian-right making every claim that the Bible is an Israeli/Jewish religion, it came from somewhere is my point and artifacts with written history are derived from Mesopotamia and Egypt. The Jews practice Judaism which is also another story of stolen or borrowed GODS of Mesopotamia/Egypt rewritten for the sake of the people that wanted POWER or whatever A GOD, it's happened in every culture look at Christianity (unfortunately), Kabbalist have a tree of life which is from Mesopotamian history and the cross of Christianity is the cross of Divinity in Mesopotamia which historical goes back farther in time unless the Sphinx and Great Pyramid can be correctly dated which would probably coincide in time with the Sumerian/Annunaki story but that is speculation they are the same GODs in every culture. When one culture has two contradicting religions meaning they accept the Old Testament but the New Testament is not reconized should make one wonder. The interpretations written of fallen angels is that angels from above came down and nothing more but does show writers did understand and somewhere a fairey tale emerged about an angel rebelling against GOD and was cast out of heaven are in fact either misunderstood events or ancient fantasy tales. How could they worship the Serpent then say he rebelled and was cast out of Heaven which he hasn't been and is still visiting people to this day. It's really interesting story which only those with an open mind will see if they choose to research FACTS. It's strange how so-called Christians that make real Christianity look bad are destroying the history and culture of where their Bible started, it just shows once again they forgot whom the GODS are and what they taught. It's always made me wonder if the ancient people saw what we call Nordic/Blonds/ET-humans today and that was their only GOD and couldn't accept the other GODS thus demonizing them like now, maybe thats why Jesus was trying to teach acceptance, understanding, denial, love, etc.. those good things to know or if Mohammad was brought aboard a UFO/Flying saucer/GODS ride and had sexual contact with another human like what currently occurs and those are the VIRGINS he speaks of but then he could be just talking about 72 PURE BEINGS or what about the 72 Archons or 72 demons of Lemegeton Goetia, or the 72 Gods of Kabbahlist. These people that claim knowledge are supposed to know this information and the knowledge that was handed down is not being practiced or preached by all parties which is a must if one seeks to summon the spirits of the air or the sky GODs of ancient history. Spiritual union is not given to those that demand it but as a reward for those that will accept the truth and understand it. Download the photos and compare the Cumberland/Solwayfirth spaceman photo(zoom in) to the Meso and South American statue of The Feathered Serpent squatting or the ancient statue of Vishnu as Narasimha, his fourth avatar destroying another demon Hiranyaksha, Narsimha means man-lion, the black statue close up of him shows he has claws like the Mesoamerican drawing. I think they both look more like Dragons/Reptile/Humans or even cat like but electromagnetic affects can alter brain function and is the reason again for descrepencies . 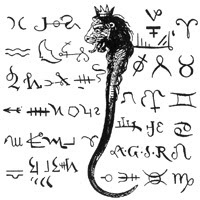 The features are identical down to The Feathered Serpents attire which is where he derived one of many names from the symbolic color and specie characteristics. 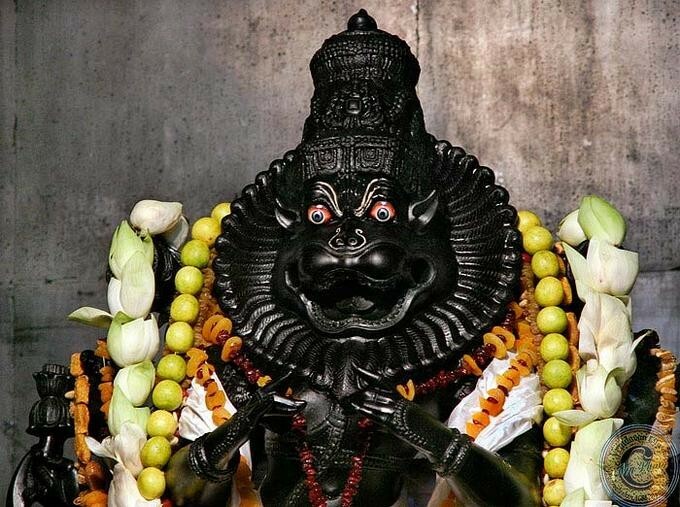 If you look close both are smiling, have something hanging from the neck, same attire, eyes and nose in correct locations and smile(Happy GODS). Look at his space cap and you will see the statues ears and horns match up to the cap. 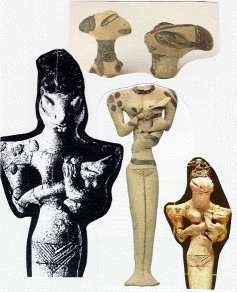 Look at the Meso American petroglyh which just coincides with the statue and see how it resembles the statutes from Iraq, Mesopotamia dated 4,500-5,000 years old. If you compare the mouths they are identical in appearance and gesture. I speak with happy GODs or they are happy when speaking with me and Tezcatlipoca/Enlil/Karasu Tengu does have a very big smile too. 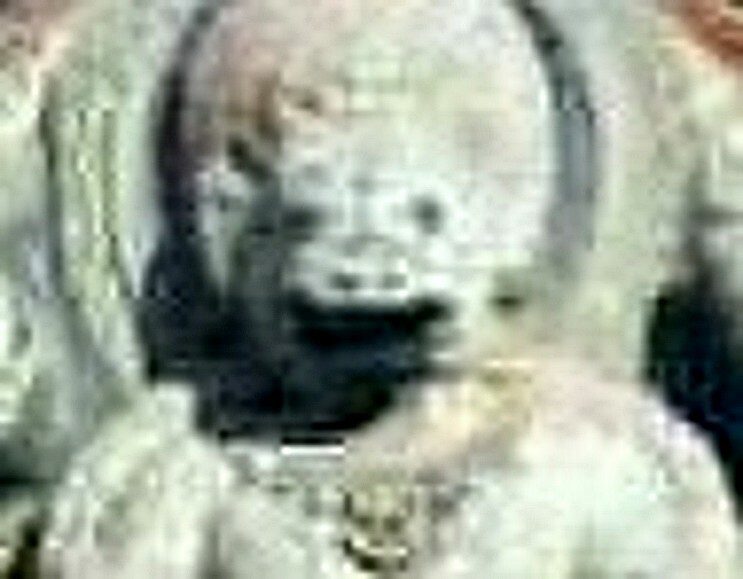 My reason for the slight differences is that the ancient people when visited where under electrical, magnetic and super natural forces that can distort thoughts or images if they do not wake you up completely when being visited their image may not be fully seen or this was one of the several serpent races or man lion in Hinduism related in appearance to the Solwayfirth photo but it's too coincidental to have serpent GODs or Dragons in every culture then to have three known GODs from different time periods and cultures having similar statues or related made of them in honor is incredible, the only thing really missing are the horns but both statues are very similar, too similar and too far in distance to be alike. 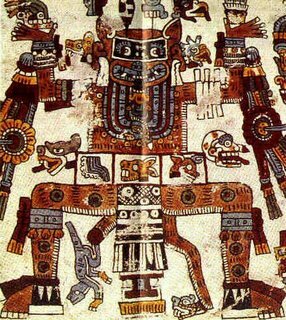 The Mesoamericans did have a man/lion/cat God that was thought to be Tezcatlipocas jaguer appearance but a Codex Vaticanus B obtained by the Vatican around the 16th century shows a GOD that looks like Narasimha. I think the people described the GODs as best as they could and mixed up some of the same GODs like other religions that have an excess of Gods/helpers/etc... One person sees a snake another a cat another a reptile another a dragon all in one, the Solwayfirth photo does have all these characteristics. 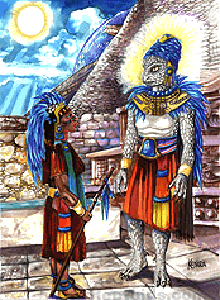 We have UFO contactees or abductees whom when reading their stories have seen Enlil/Tezcatlipoca/Karasu Tengu or large nose gray whom does not have scales and is black mixed up with Enki/Feathered Serpent or reptilian whom is gray given the descriptions and the other unknown large cranium almond colored eyed beige/brown/reddish GOD that wears the red suit that has scales also, so you can see how things can get confusing when people are being visited by a Pantheon of Gods that keep humans under supernatural forces and our ancient relatives have done their best to record history, it's can be really strange how they do their thing but it's how they did it in the past. Coincidently the Bible was written in Aramaic and many other languages originally claimed 2,000 years ago with the NT coming 400 years later which was a language of Babylon, Mesopotamia before being translated to Greek, Hebrew, Coptic, Latin, and English not to forget the Akkadians, Phoe., etc.. whom had their own too. The story just happens to coincide with an Egyptian and Sumerian story but is written slightly different from the way they interpreted their events with the GODS and we have similar stories in every culture across the world, just another mystery. Maybe the Deluge goes back to Pangea and the seperation of continents caused all the flooding which was done because humans failed to coexist with one another and this lost Atlantis is Pangea, just an idea since they have the power to turn stars on or off or cause cosmic collisions. 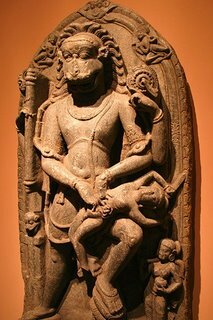 The Serpent race was recorded helping humanity in more cultures then what little negative information that has been written(I am still try to figure out Garuda and the Nagas but sounds like another my GOD is better then your GOD case or people wanted their own and seperated the GODs or they came into contact with other GODs/ETs or they just made a good sounding story up, it's a common trait currently among humans). 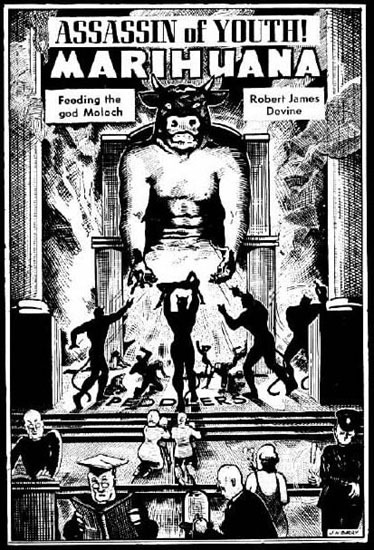 What history has shown is that humans blame things on whatever they can which includes eating from The Tree of Knowledge of Good and Evil or 10,000+ human sacrifices which are just a few examples. Humans have free will, when combined with ignorance and stupidity mistakes will occur and we have only ourselves to blame. Moses killed half his followers blaming it on GOD, then GOD got mad and delivered the commandments, it's a little obvious he wasn't suppose to kill anyone but if we could use that excuse in a court of law today everyone would be blaming the GODs for everything. The GODS were either loved or hated mainly hated by stupid humans but more cultures show a positive then negative effect they had with humans. 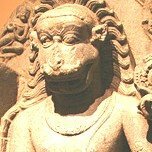 In current UFOlogy people claim seeing these GODS but their descriptions are quite off. In most UFO cases people have described green or brown scaly reptoid beings(Native American statue) around 6 feet tall but if you see the petroglyph or photo you can see they are 8 feet or taller and grey. Some claim to see yellow eyes which is on the petroglyph but the photo shows black eyes, some claim seeing a large muscular tall entity dressed in white but with an illuminated head similar to the petroglyph and many religious paintings have similar depictions of illuminated beings. 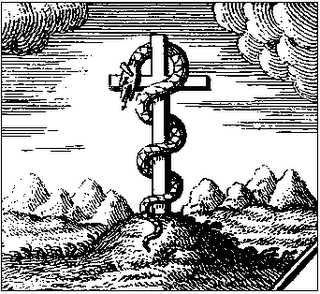 This is not the serpent as described in Revelations or in most people's imagination. 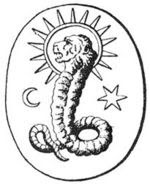 What is very contradicting is the serpent on the cross being crucified, the Serpent as being good(Nag Hammadi/Jubilee) or the depiction of Satan as a human such as GuidoReni's archangel Michael (in the Capuchin church of Sta. Maria della Concezione, Rome) tramples Satan with the vividly recognizable features of Pope Innocent X but there are other paintings with Michael battling a dragon on four legs, maybe we had real flying dragons. I have always wondered about certain verses that sound way out of context for ancient writer's one in paticular that says something about throwing that old nasty serpent down to Earth????? you can find it but the tone is redneckish. I am sorry for offending the redneck or Christian-right specie but my Christian friend is no longer Italian and claims that Christians are a specie, OK:):):):):). 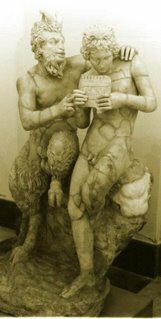 Humans have also fought over their GODS past and present in every culture and wrote information that has confused most researching history. I have one tip for you so-called educated people please help your history and research the panspermia theory in a broader perspective or shall we let someone else tell us about history minus the facts and be part of the human race that screws it all up. The leader of what the modern day UFO community calls Greys is the GOD known as Tezcatilpoca(Dark Christ, Heavenly Father, Old ones, Tall ones). The Greys are actually black and not gray but then maybe the Serpent GOD has some other small gray deities that haven't announced themselves yet. The leader is a Giant also and wears a black suit with green cape and hat. His helpers wear black suits and are very cute and they all wear space suits. Blonds/Nordics work on his same craft. The helpers can appear any color or height until they take you out of the paralytic trance they put you in when contacting people. 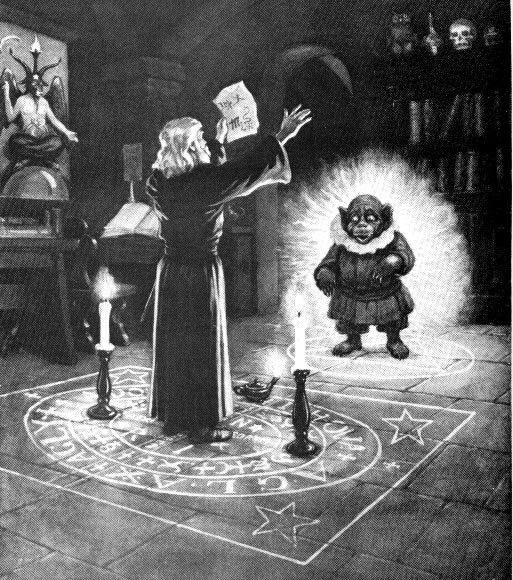 When people claim abduction and describe montrous beings they are in this paralytic state which causes figures to appear different and if they didn't freak out they could speak with their GODS but then some have an over active imagination or they have other intentions such as monetary gain that fuels their thoughts and motives. Blonds or Nordics (Tall ones) fly their own crafts and work on these same crafts. They have been seen in baby blue or two tone burgandy/silver suits with a circular insignia in the center of the uniform, their skin is pale white with others having a blue/white skin tone. Quad split Brain(see mask head) or possible Nommo (skin texture) but of Ak is the only verbal word said too me by this GOD. The leader wears a bright red suit with gold insignias and his helpers wear baby blue suits. There is a native American mask in post 3 similar to this specie and they made a cartoon super hero character with telepathic powers after this GOD on Super Friends that can not be found. I will let you do a little home work but all this makes me wonder why we had Super Heroes since they all look like Super Heroes or Godzilla which coincides with the ET story and happens to resemble a GOD from ancient history. The myths of blue eyed white haired men as Quetzacoatl may be older blonds/nordics since similar beings are seen with these super entities.All the GODS work together and they are studying us and trying to get us to evolve spiritual to the point where we are suppose to love all life and not destroy it while working on being the most dominant specie:):):):).They want to speak with everyone so just have a little acceptance and understanding.The miracles and gifts of the GODS is at humans finger tips again. Your GODS have a duality so if you want to meet the happy joyful GODS then be happy and joyful in life promote good natured ideas or thoughts and your Karma will come back too you.Most so-called abduction cases involve the "Greys" and "Reptoids" these two species have not been described correctly by anyone and most so-called reputable UFO sites claim Zetas are the Greys or the Greys are the reptoids which both are incorrect just look at the evidence. 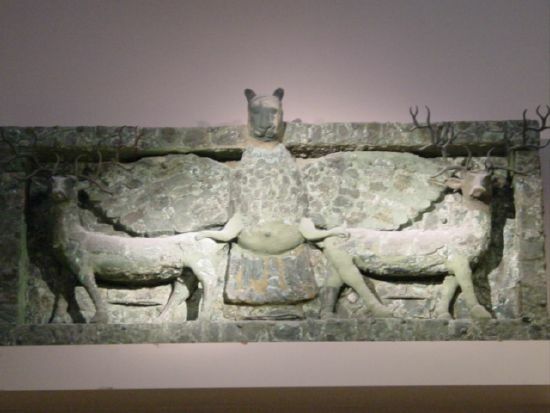 Humans have made bad claims against their GODS or space aliens by western standards which they failed to describe these super beings correctly or make the connection historically. This also logically explains the white, red, blue or black Tezcatlipoca and Quetzacoatl myths of various cultures depictions and interpretations of the GODS since these colors dominate in every cultures myths. All ancient history that remains of history was written by humans some people really came into contact with the GODs and those stories need to be addressed, every culture had black, blue, red and white GODs which were the colors of them and/or their space suits. The Blue Gods are the Nordics, the Black God is Tezcatlipoca-etc..., the Serpent is the White GOD and the Red God is the other Red Serpent looking large cranium GOD with the red space suit but there are many with similar colors. If most think these GODS are bad then why did they stop 3 missle test in the 1960's Cumberland-England-Australian bluestreak test, Atlas, Gemini and other test in 1964. The Australian test resulted in contact with two tall humanoid beings wearing white suits while in New Mexico of that same year police officer Lonnie Zamora was able to observe a UFO land and two humanoid beings in white emerged briefly, coincidence. Some of the test obviously had bad futures which would explain any intervention. Acceptance, understanding and love get you farther then fear, hate or survival of the fittest mentality which is a lower intelligence trait and being mature spiritually is required for higher intelligence in the universe. 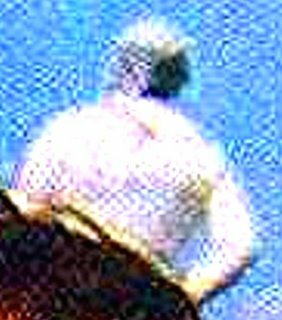 Thank you James Templeton of Cambria, England, your GODLY figure in your photograph has been identified as the Feathered Serpent or Serpent race. Here are a few direct links so you don't have to spend forever searching.